Even though the two have little in common and there is no connection between them I can’t help but compare the latest fortunes and most recent outputs from my favorite veteran melodic metal bands from the 90s, the times I was really into that style. Then, both Virgin Steele and Royal Hunt occupied significant amount of my music listening times. Today Virgin Steele is a pale shell of their heyday past, incoherent and stumbling on their last two albums. Meanwhile, Royal Hunt, with stalwart Andre Andersen still at the helm, found their niche in the symphonically produced progressive metal and continue going strong. Thirteenth album and all, titled Devil’s Dozen, the Danes are not falling victim to the superstition or the curse and their latest continues very much where A Life to Die For left off. DC Cooper, back by popular demand, still lends his talents to the band, his voice is unmistakable and immediately recognizable, this time with a slight touch of vocal processing and maybe just a little bit more in your face in places (So Right So Wrong). 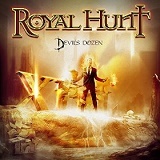 Royal Hunt polished orchestral sound endures and carries on. Their compositions, 5-7 min in length, are dense, enveloping and largely uplifting (So Right So Wrong). The band’s ability to write involved songs where all parts fit together organically has not failed them and one can only marvel how they manage to tie up inviting intros, trademark monster singalong choruses, yet find room for guitar players to showcase their skills on solos which seamlessly fit in. Devil’s Dozen songs, although connected by style and delivery, vary from big dramatic liturgical semi-balladic Until the Day which reminded me of Paradox to speedy and energetic A Tear in the Rain, which proves that Royal Hunt can still go at Martial Arts speeds. Only Royal Hunt can seemingly connect the lounge piano with a darker more dramatic mood on Heart on a Platter. The melodies are easy to pick out, on the surface, but it is the arrangements that make them rich and enjoyable. Just like A Life to Die For, Devil’s Dozen makes use of some ethnic rhythms. Whereas Hell Comes Down from Heaven on A Life to Die For had big Japanese war drums going, the opener So Right So Wrong on Devil’s Dozen plays the beat from some mysterious Pacific island, and Riches to Rags has an obvious Irish Riverdance motif. What Devil’s Dozen does not have is an obvious standout hit, the Bullet’s Tale or Hell Comes Down from Heaven from A Life to Die For. May You Never (Walk Alone) comes close. Piano intro, tempo ramp up, captivating bridge, tight double bassed flyby chorus – the ingredients are all there. Honestly, if Denmark ever considered another Eurovision entry and Royal Hunt acquiesced, perhaps Mr. Andersen and Co could participate and win. They certainly have the professional pedigree, wherewithal and understanding of what pleasure points have to be hit in a human brain to deliver enjoyable melodic songs, be the style metal, hard rock, or even more general radio friendly consumption.